Wow. I’ve always been a fan of Vidalia onions. I load up on them while they are available (for a short time) here in Indiana. 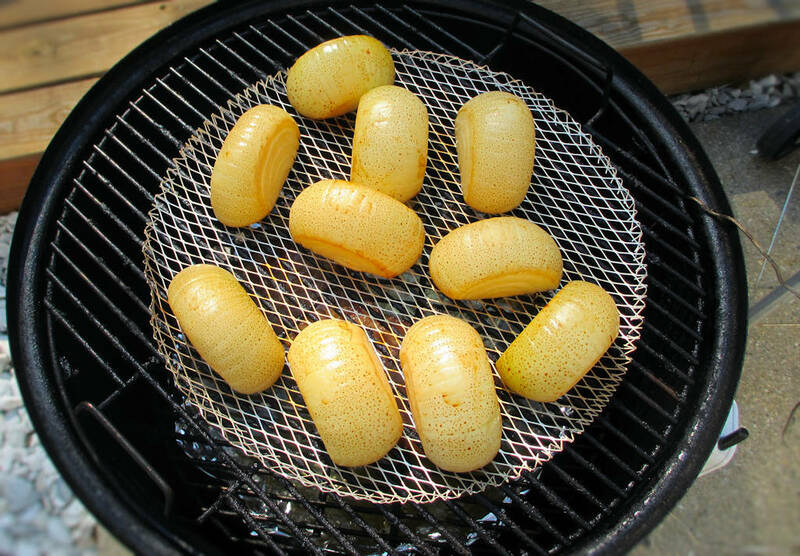 I often grill them, but smoking them was a bit new to me. It’s certainly easy to do. Just cut them in half and toss them on the smoker for an hour or so until they’re as smoky as you want them. Done. This recipe takes those wonderful smoked sweet onions and makes them into a fantastic dip. A bit of smoky flavor, a little onion bite, and lots of creamy goodness. It’s a thicker dip, so don’t reach for some wimpy thin chips that aren’t going to handle the load. I used bagel chips. The combination was perfect. I smoked the onions on my Weber Smokey Mountain smoker since I already had it going, cooking some pork belly for bacon. The onions only take a little while to cook, freeing up the smoker for other good things. This recipe comes from The Elk, a bar/restaurant in Spokane, Washington. The original version is used as a dipping sauce for chicken. I decided to use it as a chip dip. And what goes great with smoked onion dip? Yep, you guess it. Smoked potato chips. Let onions cool then chop roughly and place into a blender or food processor and process until smooth. In a large bowl combine the pureed onions and the remaining ingredients, adding more salt if desired.